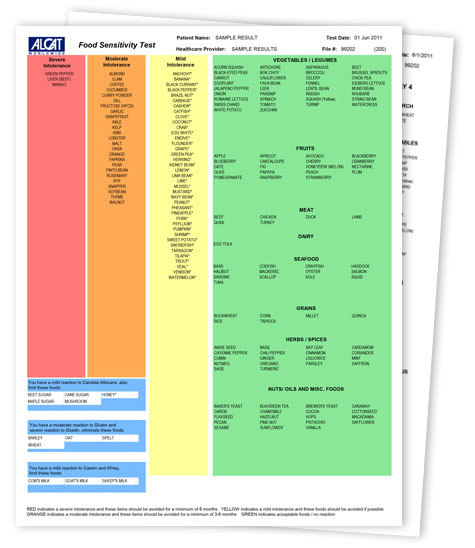 The Alcat Test identifies adverse immune cell reactions associated with food and chemical sensitivity. It is an accurate method to evaluate the immune system’s reactions to foods following an ex vivo challenge of the white blood cells. The results from the Alcat Test can help determine which foods and other substances may trigger unwanted inflammation and related symptoms. The Alcat Test enables providers to help patients improve chronic health issues through dietary change. immunological markers of immune activation. The Alcat Test gives healthcare professionals a tool for managing conditions linked to inflammation and chronic activation of the immune system. The Alcat Test measures individual responses to foods and other substances at the cellular level and may reveal the underlying trigger of certain symptoms. The Alcat Test measures food/immune reactions through stimulation of leukocytes. The leukocytes, which comprise five classes of white blood cells (WBCs), including monocytes, lymphocytes, eosinophils, basophils and neutrophils (~ 70 - 80% of WBC's) can be challenged with individual food or chemical extracts. Immunologic defense reactions, e.g. of neutrophils, initiate an instrumental primary role in inflammation. While this is a very effective first-line defense strategy against acute infections, chronic activation of the immune system may lead to health disorders. The Alcat Test does not identify type 1 classical IgE mediated (anaphylaxis) allergies. The difference between the Alcat Test and IgG antibody testing: Food and Chemical sensitivities are mediated by multiple pathogenic mechanisms. By using the cellular approach, instead of a single antibody such as IgG, the Alcat Test can identify food and chemical sensitivities regardless of the pathway (immunologic, toxic, pharmacologic). The cells release free radicals and inflammatory mediators without antibody involvement. The majority of studies suggest that food specific IgG antibodies are protective and thereby not pathogenic. Alcat Test results include an easy to read color-coded test report classifying tested items according to degree of cellular reactivity. Included with each report is a wallet-sized test results card, Foods to Avoid list, food rotation plan (when testing 100 foods or more) and a comprehensive Understanding your Alcat Test Results patient guidebook.